TRAIN SCORES OF CHRISTIANS IN THE BASICS OF SOUL WINNING. "I had never won a soul to Christ. Now, I have won seven and five have been baptized!" The 21st Century Soul Winning Seminar is a comprehensive program that trains entire congregations in the basics of Soul Winning. 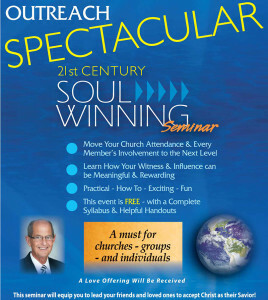 David Wood Ministries staff will come to your church to train the entire congregation in Soul Winning absolutely FREE! Every pastor, church leader and layman will find this seminar invaluable for church growth, increased salvations, baptisms, excitement and a greater vision for lost souls. This seminar will train and equip church members to lead friends and loved ones to accept Christ and give them confidence to share Him with others. The 21st Century Soul Winning Seminar is a prerequisite for all who plan on attending and graduating from the Soul Winning Directors Institute.